First, a revision of the grading system is in order. Back in 2010, textbooks that said nothing about climate change (but otherwise had an accurate presentation of environmental economics) received a C. In 2017, however, failing to discuss climate change is like failing to discuss the 2008 financial crisis. So a book that says nothing about climate change (and there is one, by Roger Arnold) will now receive a D. Books that receive lower grades (and there are three: Miller, Schiller and Gebhardt, and Frank, Bernanke, Antonovics, and Heffetz) are judged to be worse than nothing. On the other end of the scale, in order to receive an A+ a book must either do a truly exceptional job in the chapter on environmental economics (as with the Chiang and Parkin textbooks) or address climate change throughout the book (as with texts by Krugman and Wells and Case, Fair, and Oster). Second, the treatment of climate change in economics textbooks is getting better. Despite the harsher grading system, this review—like the last one, in 2014—has no textbooks that warrant an F. (There were two in 2012.) And the list of textbooks that warrant an A or A+ is expanding. This is not because of grade inflation but rather because textbook authors are taking climate change more seriously and covering it more accurately. As detailed below, the Frank et al. book is riddled with errors. The good news is that it would not be hard for these authors to write a much better book. So, in the hopes that additional feedback from you will help push them to improve the book, I hope you will join me in sending a note (a polite one, please!) to the publishers at McGraw-Hill (hep_customer-service@mheducation.com) and to the authors themselves: Robert Frank (rhf3@cornell.edu), Ben Bernanke (@benbernanke on Twitter), Kate Antonovics (kantonov@ucsd.edu), and Ori Heffetz (oh33@cornell.edu). Two more notes: First, authors are invited to email me at yoram@standupeconomist.com for free and confidential feedback on draft material related to climate change. I also recommend my 2014 book, The Cartoon Introduction to Climate Change, plus the treatment of climate issues in my two Cartoon Economics books. (Full disclosure: some of my books are published by FSG, a sister company of the textbook publisher Worth.) Second, if you’re curious about my methodology: I looked at online versions of these textbooks (via VitalSource) and searched them for keywords like “climate change” and “global warming” and “pollution”. Grades are necessarily subjective, but, well, read on and you can judge for yourself! So there is a broad consensus among economists—although there are some dissenters—that government action is needed to deal with climate change. There is also broad consensus that this action should take the form of market-based incentives, either in the form of a carbon tax—a tax per unit of carbon emitted—or a cap and trade system in which the total amount of emissions is capped, and producers must buy licenses to emit greenhouse gases. There is, however, considerable dispute about how much action is appropriate, reflecting both uncertainty about the costs and benefits and scientific uncertainty about the pace and extent of climate change. A fabulous bonus is Chapter 24 (“Long-run economic growth”), which has a section on environmental issues that does an excellent job of differentiating Malthusian resource scarcity concerns from climate-change concerns, followed by an excellent treatment of climate change. This pioneering treatment of climate change in the macro section on long-run growth is fabulous. One concern, however, is the dated material on oil prices and reserves: Figure 24-10 shows the real (inflation-adjusted) price of oil from 1949-2011 and argues that “the real prices of natural resources have soared”, but in fact oil prices have fallen dramatically since 2011. And the book’s claim that “a number of oil company executives [believe] that the growing difficulty of finding new oil fields will cause oil production to plateau… in the fairly near future” is the same language that was in previous editions of the text (going back at least to the revised 2nd edition, from 2009) and appears to ignore the fracking revolution. The primary causes of climate change are related to actions that emit greenhouse gases… The largest portion of greenhouse gases is carbon dioxide, which is created by fossil fuel usage, industrial production, and deforestation… The major impacts of climate change are in the areas of food security, water resources, ecosystems, extreme weather events, and rising sea levels. The difficulty with addressing these effects is that unlike air or water pollution that can be seen today, climate change has a cumulative effect. In other words, this year’s CO2 adds to that from the past to raise concentrations in the future. Once CO2 levels reach a certain level, it may lead to extreme consequences that cannot be reversed. The global environment is essentially a common resource with many public goods aspects, and climate change is a huge global negative externality that extends long into the future. Chapter 13 (“Externalities and Public Goods”) includes a wonderful and lengthy section on “The economics of climate change and sustainable development” that includes the quotes above, plus a terrific graph of global greenhouse gas emissions based on IPCC data. Elsewhere in the chapter there’s a great sidebar on “Cap-and-Trade: The Day Liberal Environmentalists and Free-Market Conservatives Agreed”, and the chapter starts with a picture of a calving glacier (and a graphic showing the decline in multiyear ice in the Arctic between 1980 and 2012) and a discussion of climate change and potential sea level rise. Minor quibbles: The caption accompanying the graphic of Arctic ice would be better if it said something like the following, which is admittedly a mouthful: “Although melting Arctic ice doesn’t raise sea levels because the ice is already floating, the global warming it is connected to does raise sea levels through thermal expansion and through the melting of other glaciers and ice sheets.” Also, the graphic of renewable energy production on the next page would be better if it also showed the (small) fraction of total electricity production that comes from renewables. Clearly, the most significant and hotly debated issue of externalities is global warming. The 2007 Nobel Peace Prize was awarded to former Vice President Al Gore and the Intergovernmental Panel on Climate Change, a group of 2,500 researchers from 130 nations that issued a number of reports linking human activity to the recent rise of the average temperature on Earth. Although there is some disagreement, most scientists predict that absent a change in policy major adverse consequences such as dramatically rising sea levels are likely. The control of carbon emissions is one area in which many economists have argued strongly for the use of a tax… Although we do not yet have a nationwide tax on carbon, we have seen a number of organizations using their own internal carbon “taxes” to change the behavior of their workers. Walt Disney and Microsoft are two of the leaders among U.S. companies in using carbon taxes. In recent years, concern about the environment has led some people to question advantages of free trade… A study by the Tyndall Centre for Climate Change Research in Britain found that in 2004, 23 percent of the greenhouse gas emissions produced by China were created in the production of exports. In other words, these emissions come not as a result of goods that China’s population is enjoying as its income rises, but as a consequence of the consumption of the United States and Europe, where most of these goods are going. [D]emand for clean air increases with income, when needs for food and shelter are better met. It should surprise no one who has studied economics that there are debates between developing countries and developed countries about optimal levels of environmental control. These debates are further complicated when we recognize the gains that consumers in developed economies reap from economic activity in the developing world. Much of the increased carbon emitted by Chinese businesses, for example, is associated with goods that are transported and traded to Europe and the United States. These consumers thus share the benefits of this air pollution through the cheaper goods they consume. Chapter 16 (”Externalities, Public Goods, and Common Resources”) includes excellent material on climate change, and the topic also comes up in a host of other chapters on topics ranging from long-run growth (in an excellent section on “Growth and the environment and issues of sustainability”) to international trade (in a section on “Free trade or protection?”). Minor quibbles: The book could use a more definitive statement connecting human activity to climate change. Instead we get meandering quotes like “Reports of melting ice caps have fueled worry among scientists and others across the world about global warming.” Also, a quote about different types of air pollution—“A steel firm may produce carbon emissions as well as steel, contributing both to air pollution and global warming”—doesn’t correctly describe the issue because carbon emissions are not a local air pollution problem. Updated 12/2/17. See comments below. Burning coal to generate electricity emits carbon dioxide that is warming the planet. Logging and the clearing of forests is destroying the habitat of wildlife and also adding carbon dioxide to the atmosphere. These activities are negative production externalities, the costs of which are borne by everyone, and even by future generations. The trends in local U.S. air quality and global greenhouse gas concentrations are starkly opposing… Figure 2 shows the global trends in carbon dioxide (CO2) concentration and temperature. Both trends are starkly upward… Scientists agree that the scale on which we burn fossil fuels is the major source of the rising CO2 trend. There is more uncertainty about the effect of the increase in CO2 on global temperature, but the consensus is that the effect is significant. In 2007, the Supreme Court ruled that the EPA has authority to regulate greenhouse gas emissions. Introduced in 2008 at $10 per metric ton of carbon emitted, British Columbia’s tax increased each year to its final rate of $30 per metric ton in 2012. The tax applies to all forms of carbon emission from coal, oil, and natural gas. The tax is revenue-neutral, which means that other taxes, personal and corporate income taxes, are cut by the amount raised by the carbon tax. Between 2008 and 2012, carbon emissions fell by 17 percent. When 1 ton of coal is used to generate electricity, it emits 3.67 tons of CO2. The amount of carbon emitted from using coal and other fossil fuels has increased the atmospheric concentration of CO2 by 50 percent since 1800. Our 2014 review gave the 11th edition of this book the first-ever A+ grade, citing “great climate science graphs and summaries, a fabulous comparison of local and global air pollution trends, and thought-providing discussions of the economics, including a ‘debate’ between Nicholas Stern and Bjorn Lomborg about whether we should be doing more to reduce carbon emissions.” All of that is still there, plus sections on carbon taxes in British Columbia and elsewhere. The 12th edition, which was published in 2015, also has a sidebar on the Clean Power Plan, but there’s one problem: the updated Figure 2 graph of global trends of CO2 and temperature reverses the labels on the two data sets. 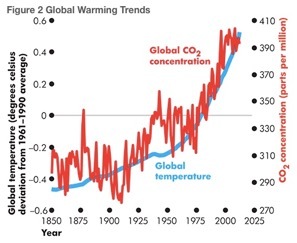 (See first graph below; the red should be temperature and the blue should be global CO2 concentrations.) That’s a significant mistake, and drops the grade for this edition to an A- , but this is still a great book. After publishing an earlier version of this post, I received from the author a near-final draft of the forthcoming 13th edition, which will correct the reversed labels. (See second graph below.) It will also replace the sidebar on the Clean Power Plan with a discussion of state efforts in light of President Trump’s announcement to withdraw from the Paris Accord. So this 13th edition gets an A+. Nitpicks about the Nov 2017 draft of the 13th edition: If coal was 100% carbon, it would be correct to say that “When 1 ton of coal is used to generate electricity, it emits 3.67 tons of CO2.” But coal is apparently more like 60-80% carbon, so this quote doesn’t have the emissions numbers quite right. (For more on this, see the discussion at the end of the O’Sullivan review below about carbon taxes and C versus CO2 and 44/12=3.67.) The O’Sullivan discussion also explains why the quote above about the BC carbon tax would be better if it said the tax was introduced in 2008 at $10 per metric ton of CO2, not per metric ton of carbon. Also, I think the claimed 17% reduction in CO2 emissions in BC is probably overstated; the best analysis I’ve seen (focused on motor gasoline) is a 2016 working paper by Antweiler and Gulati: “We find conclusive evidence that higher fuel taxes and BC’s carbon tax are shifting car purchases towards higher fuel efficiency. A counterfactual simulation suggests that without BC’s carbon tax fuel demand per capita would be 7% higher, and the average vehicle’s fuel efficiency would be 4% lower.” (See also Murray and Rivers 2015, which estimates a 5-15% reduction overall, and the references in Rodio 2016.) Finally, note that the BC carbon tax is supposed to be going up again, and also moving away from revenue-neutrality. According to widely used scientific models, greenhouse gasses from industrial and consumer sources trap heat within the earth’s atmosphere. That causes a gradual warming of the planet, which in turn has the potential to trigger changes not just in temperature but also in rainfall patterns, storm tracks, ocean currents, and so on. A recent report by a US government task force gave a range of estimates of $12 to $109 per ton of CO2E for the external costs of carbon emissions, as of 2015; and there are credible economists who estimate the cost to be even higher or even lower. Popular accounts of the consequences of climate change in film and novels sometimes portray a future world in which a greatly reduced human population is living in a post-apocalyptic world of poverty and conflict. However, the standard scientific and economic models used by the IPCC and others offer no support for those fictional scenarios… If you want a world that is both hot and impoverished, you have to look beyond the standard models. The book itself is also somewhat unusual. It is published by BVT (“the publisher of affordable textbooks”) and comes at a fraction of the price of the other textbooks in this review. The end-of-chapter problems are open-ended and invite full-paragraph answers rather than numerical or other quick responses. If you like that approach, this book’s treatment of climate change is hard to beat. Note, however, that there are a few idiosyncrasies (such as writing “CO2E” instead of “CO2e” for carbon dioxide equivalent) and also that the introductory chapter makes the mistaken claim (in a discussion of methane from cows) that the U.S. does not have much oil. A good example of the central role that economics plays in policy debates is the debate about global warming. Almost all scientists are now convinced that global warming is occurring and that human activity such as the burning of fossil fuel is one of the causes. The policy question is what to do about it. To answer that question, most governments have turned to economists. The first part of the question that economists have considered is whether it is worth doing anything, and in a well-publicized report commissioned by the British government, economist Nicholas Stern argued that, based upon his cost/benefit analysis, yes it is worth doing something. The reason: Because the costs of not doing anything would likely reduce output by 20 percent in the future, and those costs (appropriately weighted for when they occur) are less than the benefits of policies that can be implemented. The content in this book is great: thoughtful and thought provoking, with a good sense of where there’s consensus and where there’s disagreement. Chapter 8 (“Market failure versus government failure”) includes an excellent section on “Climate change, global warming and economic policy”. There’s also a neat sidebar on “Economists and market solutions” in the very first chapter of the book. One of our most challenging environmental problems concerns climate change… In a recent report, the IPCC [concludes that] warming of the climate system is unequivocal [and that] the energy balance of the climate system has been altered by changes in (a) atmospheric concentrations of greenhouse gases (GHGs) and aerosols, (b) land cover, and (c) solar radiation. Between 1970 and 2004, the GHG emissions from human activities increased by 70%. An ongoing environmental issue is how to respond to the problem of global warming caused by greenhouse gases. One approach is to tax carbon-based fuels… Carbon taxes have been imposed by governments around the world. In Canada, the province of British Columbia has a revenue-neutral carbon tax of $30 per ton of CO2. The revenue raised from the carbon tax is returned to taxpayers through reductions in taxes on personal and business income. Chapter 31 (“External Costs and Environmental Policy”) expands the treatment of climate change to include terrific paragraphs (such as the ones excerpted above) on climate science and on British Columbia’s carbon tax. I do have a few minor quibbles, e.g., the first paragraph quoted above cites the 2007 IPCC AR4 report and should be updated to the 2013 IPCC AR5 report (although the broad outline remains correct). But these are small criticisms of an otherwise terrific presentation. Cars cause smog. Moreover, the burning of fossil fuels such as gasoline is widely believed to be the primary cause of global warming. Experts disagree about how dangerous this threat is, but there is no doubt that the gas tax reduces the threat by discouraging the use of gasoline. Corrective taxes are unlike most other taxes… [M]ost taxes distort incentives and move the allocation of resources away from the social optimum… Corrective taxes alter incentives that market participants face to account for the presence of externalities and thereby move the allocation of resources closer to the social optimum. Thus, while corrective taxes raise revenue for the government, they also enhance economic efficiency. A 2007 study published in the Journal of Economic Literature summarized the research on the size of the various externalities associated with driving. It concluded that the optimal corrective tax on gasoline was $2.28 per gallon in 2005 dollars… equivalent to about $2.78 per gallon in 2015 dollars. By contrast, the actual tax in the United States in 2015 was only about 50 cents per gallon. The tax revenue from a gasoline tax could be used to lower taxes that distort incentives and cause deadweight losses, such as income taxes. In addition, some of the burdensome government regulations that require automakers to produce more fuel-efficient cars would prove unnecessary. This idea, however, has never been politically popular. When the government remedies an externality (such as air pollution), provides a public good… or regulates the use of a common resource…. it can raise economic well-being. But these activities can be costly. For the government to perform these and its many other functions, it needs to raise revenue through taxation. Most scientists believe that burning fossil fuels like coal generates carbon dioxide and other greenhouse gases that can increase global warming and cause potentially costly changes in climate. Over the centuries, global temperatures have gone through many long periods of warming and cooling. Nevertheless, many scientists are convinced that the recent warming trend is not part of the natural fluctuations in temperature but is primarily caused by the burning of fossil fuels, such as coal, natural gas, and petroleum. Burning these fuels releases carbon dioxide, which accumulates in the atmosphere as a “greenhouse gas.” Greenhouse gases cause some of the heat released from the earth to be reflected back, increasing temperatures. Annual emissions of carbon dioxide have increased from about 50 million metric tons of carbon in 1850 to 1,600 million metric tons in 1950 and to nearly 9,900 million metric tons in 2013. If greenhouse gases continue to accumulate in the atmosphere, according to some estimates, global temperatures could increase by 3 degrees Fahrenheit or more during the next 100 years. Note that a Pigovian tax eliminates deadweight loss and improves economic efficiency, unlike most taxes, which are intended simply to raise revenue and can reduce consumer surplus and producer surplus and create a deadweight loss (see Chapter 4). In fact, one reason that economists support Pigovian taxes as a way to deal with negative externalities is that the government can use the revenues raised by Pigovian taxes to lower other taxes that reduce economic efficiency. For instance, the Canadian province of British Columbia has enacted a Pigovian tax on emissions of carbon dioxide and uses the revenue raised to reduce personal income taxes. The vast majority of this book is terrific. 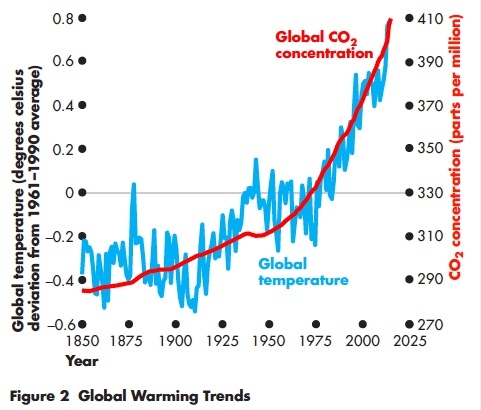 Chapter 5 (“Externalities, Environmental Policy, and Public Goods”) includes a NASA graph of temperatures since 1880; clear descriptions of global warming, its connection to fossil fuel emissions and its global significance; and solid descriptions of policy approaches including the BC carbon tax, the European cap-and-trade system, the Clean Power Plan, and more. There are, however, a few areas for improvement: the “most scientists” and “many scientists” in the first two quotes above should be shortened and strengthened to just “scientists”; the second quote above would be stronger without the first sentence; the numbers in the third quote above should be changed (a better ballpark for business-as-usual temperature change over this century is 4 degrees Celsius, or about 7 degrees Fahrenheit); and the final quote should note that BC has reduced corporate income taxes as well as personal income taxes. We have yet to mention the most threatening damaging externality of them all—global warming. The authors of this book cannot claim to be experts on the subject, which still gives rise to debate, though the skeptics who deny the dangers or the role of human actions in generating the emissions that are believed to be heating the climate seem to be retreating in their opposition. But it is clear that if the full threat materializes, the cost to humanity will be enormous… And the likely source of the problem is emissions, not only factories but you and we, the authors of this book… We all do it. [E]conomic efficiency is not society’s only goal. For example, a tax on the use of fossil fuels causes “inefficiencies” if it changes people’s behavior patterns. But these changes may be just what the government intends. The government wants people to switch to cleaner sources of energy and is willing to tolerate some economic inefficiency to accomplish this goal. We can, of course, argue whether the conservation achieved is worth the efficiency loss. But the general point is that Some taxes that introduce economic inefficiencies may nonetheless be good social policy if they help to achieve some other goal… A second and more fundamental point is that Some taxes that change economic behavior may lead to efficiency gains, rather than to efficiency losses… One important example [is a] corrective tax on pollution. One of the authors of this book (Baumol) passed away at the age of 95 in 2017, two years after this book was published, so it is with some trepidation that I criticize it, but the fact remains that its treatment of climate change is a bit of a mess. The first quote above, from Chapter 15 (“The shortcomings of free markets”), seems to be a bizarre attempt at false balance. Hard to believe, but it’s from the same book as the second quote above, which is from Chapter 16 (“Externalities, the environment, and natural resources”) and is a much better summary of climate issues. The third quote above is from Chapter 17 (“Taxation and resource allocation”) and appears to contradict itself to the point of being incomprehensible. Overall the book is not bad, but Baumol’s legacy is carried forward much more strongly by the environmental economics bible he wrote that countless grad students learned from while pursuing their PhDs. [B]urning coal generates substantial particulate and carbon dioxide emissions that can contribute to health problems and global warming. [G]overnment agencies may establish costly pollution standards to attack the global-warming problem without knowing for certain whether pollution is the main cause of the problem. Consider carbon dioxide… a colorless, odorless gas that many scientists consider to be a contributing cause of climate change, specifically global warming. To reduce CO2 emissions, the U.S. government might set a cap of 5 billions tons of CO2… which would be about 25 percent below 2010 emissions levels… This by itself improves efficiency because the cap imposes scarcity… But the cap-and-trade scheme leads to even greater improvements in efficiency. [M]any economists have concluded that a cap-and-trade system would not be the best way to curb CO2 emissions in the United States. They believe that there are simply too many sources of pollution to make monitoring either possible or cost-effective… So, instead, many economists favor a carbon tax [that] would reduce consumption and lessen the externalities associated with CO2 emissions. It would also be nearly impossible to evade, so that we would not have to worry about cheating. [C]oncern over global climate change motivated President Barack Obama to propose a tradable allowances program for carbon dioxide, a greenhouse gas that contributes to global warming. The California Cap and Trade program… lets California firms buy permits from any firm in the United States that can prove that it has limited its own carbon emissions. The environmental movement has made people more aware of global climate change and how the consumption of oil adds carbon dioxide to the atmosphere. As a result, the demand for hybrid cars has increased, more people are recycling things like plastic bags, and nuclear power is once again being discussed as an alternative source of energy. Smiley faces [such as those put on the utility bills of customer with below-average consumption of electricity in San Marcos, California] won’t solve the problem of climate change. For that we probably do need changes in the price of greenhouse gas emissions. But if a nudge can moderately improve outcomes at very low cost, why not nudge? The above quotes basically encompass all coverage of climate change in this book, so it gets just barely more than the default grade of D.
Nitpicks: The second quote is an exaggeration—California only allows offsets for a small list of activities—and the third quote should say “the burning of fossil fuels” instead of “the consumption of oil”. [B]ecause oil consumption contributes to greenhouse gas emissions, the quantity of oil produced and consumed has important implications for climate change. [I]n recent years, many economists and others have wanted to increase [the gasoline] tax, for both geopolitical goals… as well as environmental goals (to help fight pollution, traffic congestion, and climate change). Food prices have always fluctuated with changes in weather. But in recent years, bouts of bad weather have caused prices to spike by much more than in the past. One reason may be that bad-weather events themselves have become more severe due to climate change. Another example of a common resource is the earth’s atmosphere. The planet is warming. To the extent that this trend is exacerbated by emissions of carbon dioxide and other greenhouse gases, the world has an interest in reducing this activity. Many countries around the world have taxed a variety of negative externalities, including… carbon dioxide emissions associated with global warming. However, another market-based approach [cap and trade] has become increasingly popular, especially for atmospheric emissions associated with climate change. Burning fuels such as coal, oil, and natural gas emit carbon dioxide. This emission causes no direct harm… [b]ut long-term concern about its environmental impacts has been growing since 1988, when James Hansen… told a congressional panel that he was “99 percent confident” that the global warming signal had arrived. Coal-fired power generators put large amounts of visible steam and invisible carbon dioxide into the air. Carbon dioxide is a greenhouse gas that may be warming the earth significantly. While there is general agreement among scientists that higher levels of carbon dioxide contribute to global warming, there is continuing debate about the form of the relationship. Some scientists believe that higher levels of carbon dioxide will substantially increase atmospheric temperatures, while others argue that the impact will be more moderate… Moreover, the earth has experienced cycles of warming and cooling prior to recent decades. Instead of forcing a smaller carbon footprint, which would greatly reduce national income, nations might be better off dealing with the uncertainties of global warming through growth and development. That movement continues with this new edition. It contains a decent statement about climate science (“[T]here is general agreement among scientists that higher levels of carbon dioxide contribute to global warming”) and from my reading there is only one factual error: in discussing the “trillion metric tons” of CO2 emissions from China and the U.S., the book is off by a factor of 1000. The book does, however, still have its problems: the paragraph about costs and benefits of a warmer world is one-sided because it only provides examples of benefits, the statement that “[c]arbon dioxide is a greenhouse gas that may be warming the earth significantly” [my italics] is too weak, the content about “cycles of warming and cooling prior to recent decades” is distracting and unnecessary, the claim that “forcing a smaller carbon footprint… would greatly reduce national income” is uncited and almost certainly wrong, etc. In short, the book’s distinct skeptic slant, although moderated significantly in this new edition, is still too slanted to provide students with a reasonable understanding of climate issues. Air pollution also adds to accumulations of various gases that may contribute to climate change. In recent years, certain scientific research has suggested that emissions of carbon dioxide and various other so-called greenhouse gases could be contributing to atmospheric warming. The result, some scientists fear, might be global climate changes harmful to people inhabiting various regions of the planet. Officials often claim that non-carbon-generated energy sources, such as battery, solar, or wind sources, can directly replace large volumes of carbon-based energy sources, such as coal, natural gas, or oil. In fact, however, utilizing the alternative carbon-based energy sources generally requires first expending energy produced using carbon-based sources. The net reductions in reliance on carbon-based energy sources typically are much smaller once the usage of carbon-based energy to generate battery-, solar-, or wind-generated energy is taken into account. This book—a previous winner of the Ruffin and Gregory Award for the Worst Treatment of Climate Change in an Economics Textbook—is very weak on climate science and uniformly one-sided when it comes to environmental issues, with sidebars including “How Behavioral Responses to Appeals to Conserve Energy Boost Carbon Emissions” and “The Environmental Protection Agency Creates a Negative Externality”. Claims like the ones in the last quote above lack citations, and the book even veers towards conspiracy-theory land with a “For Critical Thinking” question: “Why do you suppose that some observers have called for requiring installation of devices that would enable governments to monitor households’ energy consumption?” It’s even pretty lousy on basic environmental economics: a section titled “Mixing Government Controls and Market Processes: Cap and Trade” confuses market-based instruments with command-and-control approaches. On the plus side, the treatment of climate policy is quite up-to-date, with a decent discussion of the Paris Agreements (although the claim that the goal is to limit temperature increases to no more than 1.5°C should not include the phrase “by 2050”) and a good analysis of the problems of the EU cap-and-trade system. As carbon dioxide is building up in the atmosphere, it is creating a gaseous blanket around the earth that is trapping radiation and heating the atmosphere. Scientists predict that this greenhouse effect will melt the polar ice caps, raise sea levels, flood coastal areas, and turn rich croplands into deserts within 60 years. The hole in the ozone layer and the earth’s rising temperature are at the top of the list of environmental concerns. Forget about littered beaches, smelly landfills, eye-stinging smog, and contaminated water. The really scary problem… is much more serious: some scientists say that the carbon emissions we’re now spewing into the air are warming the earth’s atmosphere. If the earth’s temperature rises only a few degrees, they contend, polar ice caps will melt, continents will flood, and weather patterns will go haywire. The natural release of CO2 dwarfs the emissions from human activities. But there’s a concern that the steady increase in man-made CO2 emissions—principally from burning fossil fuels like gasoline and coal—is tipping the balance… A 2013 United Nations study concluded with 95 percent certainty that human activity (power generation, transportation, etc.) is increasingly responsible for the rising greenhouse gas concentrations and the climate change that accompany them. Chapter 27 (“Environmental protection”) is a bizarre mix of unwarranted and factually inaccurate climate alarmism (“melt the polar ice caps… within 60 years”!) and unwarranted climate skepticism (mostly in tone—e.g., “some scientists say”—rather than factual content). The book devotes way too much space to the Kyoto Protocol (including the mistaken claim that “the developing nations of the world promised to curb their growth of emissions”) and repeatedly mentions climate change in the same breath as the ozone hole. (Much of the general public thinks that these are the same thing, which of course they aren’t.) This book came very close to winning this year’s Ruffin and Gregory Award for the Worst Treatment of Climate Change in an Economics Textbook, and without a complete revamp it will be a favorite to win next time. Growing atmospheric concentrations of carbon dioxide… are widely believed to be a principal contributor to global warming… According to recent estimates from [MIT], the median forecast is for a climb of 9°F by century’s end, in the absence of effective countermeasures.2 [This footnote cites an MIT working paper from 2009.] The same model estimates a 10 percent chance of temperature rising by more than 12°F. If that happened, the permafrost would melt, freeing vast quantities of methane into the atmosphere. Methane is 50 times more potent a greenhouse gas than CO2. Thus, according to the MIT model, we face a roughly 1 in 10 chance of global warming sufficient to extinguish much of life on Earth. The Intergovernmental Panel on Climate Change estimated that [a] tax of $80 per ton on carbon emissions would be needed by 2030 to achieve climate stability by 2100.3 [This footnote cites a CBO report from 2008.] A tax that high would raise the price of gasoline by 70 cents a gallon. This figure was determined, however, before the arrival of the more pessimistic MIT estimates… So let’s assume a tax of $300 a ton, just to be safe… Portions of [the tax revenue] could help pay down debt and rebuild crumbling infrastructure, or reduce other taxes. The previous edition of this text received a grade of C+ when my colleague Dani Ladyka and I reviewed it in 2012. 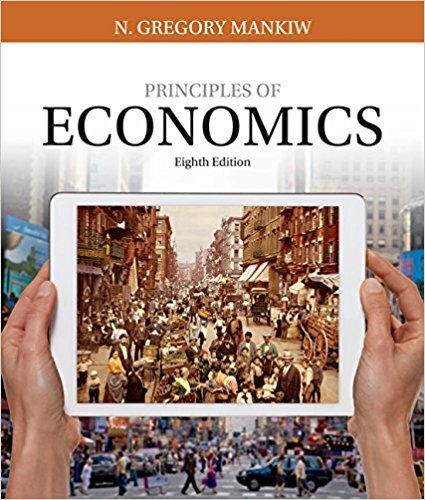 This new edition is not substantially different, but under the new grading system it receives a grade of D- and is this year’s winner of the Ruffin and Gregory Award for the Worst Treatment of Climate Change in an Economics Textbook. Why? One reason is that other books have been getting better, but the main reason is that this book has not been aging well. What does IPCC AR5 say about temperature increases by 2100? See this figure, with details in Table SPM.2 here. Under the high-emissions scenario known as RCP 8.5, it projects a mean temperature increase during this century of 3.7°C (6.7°F) with a 5% chance of temperature increases higher than 4.8°C (8.6°F). That’s plenty scary, but it’s not a 10% chance of 12°F. These ranges of $20-$80 and $5-$65 are a far cry from the language in the book about “a tax of $80 per ton on carbon emissions would be needed…” But the book goes on to hypothesize “a tax of $300 a ton, just to be safe.” This kind of exaggerated hypothesizing does real damage: I was the founder and co-chair of a ballot measure campaign in Washington State that would have created a tax of $30 per ton of CO2, rising to $100 per ton by mid-century. The measure lost, in part because of opposition from environmentalists who argued that the tax was a “green-washed delay tactic” that was “cosmetic”, i.e., that it was too small to significantly reduce emissions. What the authors of this textbook should have done (and what they should do in the next edition) is follow basic academic practices. Don’t rely on secondary sources (like the CBO report) when you can go back to primary sources (especially the IPCC). Don’t cherry-pick your numbers. Don’t misquote your sources. And, most of all, don’t rely on semi-random sources like an unpublished working paper when there is an authoritative source like the IPCC. Instead, this book commits just about every sin under the academic sun. The result is a wild-goose chase that distracts readers from real problems and real solutions. And that’s why this book wins the 2017 Ruffin and Gregory Award for the Worst Treatment of Climate Change in an Economics Textbook. Please join me in sending a note (a polite one, please!) to the publishers at McGraw-Hill (hep_customer-service@mheducation.com) and to the authors themselves: Robert Frank (rhf3@cornell.edu), Ben Bernanke (@benbernanke on Twitter), Kate Antonovics (kantonov@ucsd.edu), and Ori Heffetz (oh33@cornell.edu). Thanks for this review. It’s a helluva lot of work but very revealing. After all, the lessons in classrooms are the greatest source of knowledge, and the environment is an important topic for people to understand.